Snowstorm: The start of Mushy Monday! I come up with the worst names. I decided to follow the blogging trend of everyone and share with all you nosey people out there Mister Snow and I's love story. If you don't care (I'm talking to you Michelle), then you should skip out on Mushy Monday's posts because that's what they're going to be about. The love story will take up about seven posts and then the eighth post will be our engagement story. Whether Mushy Monday will be disbanded or continued with all the wedding shenanigans coming up after the eighth post is yet to be seen. To start Mushy Monday off right, let me introduce you to someone you may have seen a lot of on the blog lately. His name is Andrew Snow and he's my fiance (still getting used to that word). 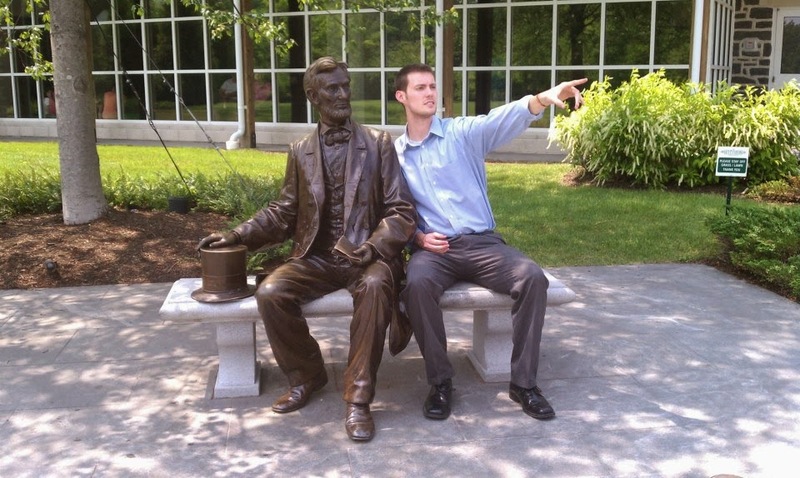 Note: My fiance is the live man in this picture, not Lincoln. I promise I'm engaged to an actually person and not a statue. Anyways, he's my favorite. That is all. Click here for part one of the love story.